Earth's closest celestial neighbour will appear to loom larger and glow brighter than usual on Saturday night, with astronomers bracing for a spectacular cosmic event called an "extreme supermoon." The moon's orbit is an ellipse, not a perfect circle. On Saturday, it will be at its closest point to Earth, making it appear larger and brighter in the sky. Earth's closest celestial neighbour will appear to loom larger and brighter than usual on Saturday night, as astronomers anticipate a cosmic event called an "extreme supermoon". Scientists say the natural phenomenon — in which the moon reaches its closest point to this planet — will cause abnormally high and low tides worldwide. 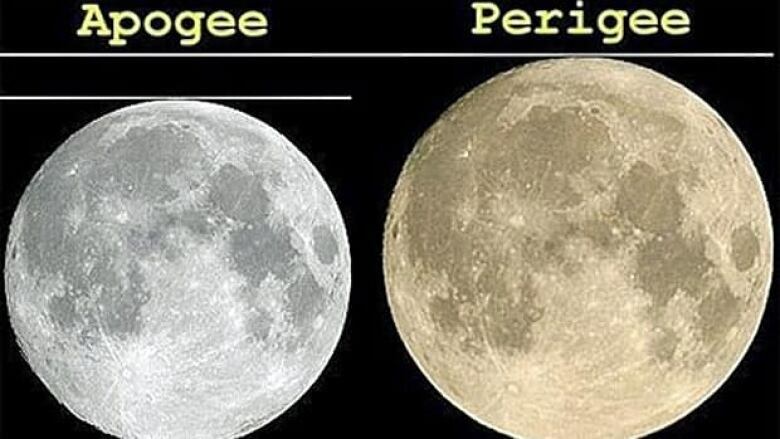 The occurrences, technically known as "lunar perigees," were previously visible in 1955, 1974, 1992, 1993 and 2005. But what makes this one particularly special is that it coincides with a full moon, which hasn't happened since 1993, according to Geoff Chester of the U.S. Naval Observatory in Washington, D.C. While some believe there's a connection between lunar perigees and global calamities such as tsunamis, extreme seismic activity and volcanic eruptions, others have dismissed such theories as hogwash. Astrologers have been quick to blame last week's disastrous earthquake and tsunami in Japan on the supermoon. But Dr. James Garvin, the chief scientist at NASA's Goddard Space Flight Center, said in a release Friday that the effects of Saturday's moon should be minor. "According to the most detailed studies by terrestrial seismologists and volcanologists, the combination of the moon being at its closest to Earth in its orbit, and being in its ‘full moon' configuration … should not affect the internal energy balance of the Earth since there are lunar tides every day." Dr. David Harland, a space historian, agreed, telling Britain's Daily Mail newspaper that while "it's possible that the moon may be a kilometre or two closer to Earth than normal at a perigee … it's an utterly insignificant event." The full moon should appear to be about 15 per cent larger and up to 30 per cent brighter than usual on Saturday evening, U.S. scientists said. Stargazers are advised to check it out around sunset, when it's closest to the horizon. The average distance between the Earth and the moon is about 383,000 kilometres. The full moon on March 19 will be about 356,577kilometres away.